Harrisburg, Penn. 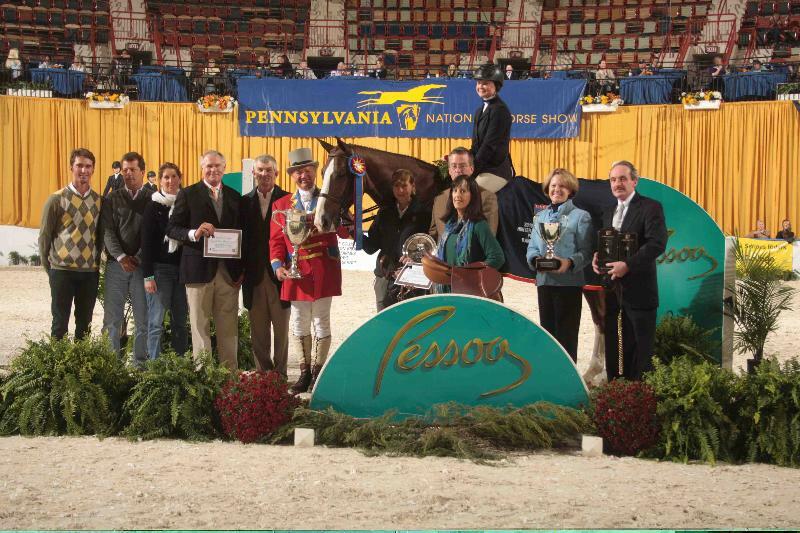 - October 17, 2010 - A total of 208 junior riders came to the 65th Pennsylvania National Horse Show and competed for the prestigious national equitation championship, the Pessoa/USEF Hunter Seat Equitation Medal Finals Presented by Randolph College. It came down to a ride off and exchange of horses between Hayley Barnhill of Collierville, Tenn. and Samantha Schaefer of Westminster, Md. that resulted in the win for Barnhill. The first round of competition challenged the 208 riders with a straightforward course which judge George Morris said was often decided by the first fence and a bending line that was mis-walked by many riders who miscalculated the inside track. Twenty-eight riders were called back for the second round and jumped in reverse order with Schaefer entering the ring first and Barnhill following behind fourth in the order of go. "They were dead even in the finals - this really separated them. Sam got stuck at the first jump on Hayley's horse. Hayley set the pace - really - she nailed it. Both girls rode fantastic. It was a tough decision - that's why we had them switch," explained judge Winkel. 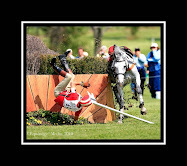 "Both riders did a tremendous job executing, as well as being stylish. You could tell they've ridden a lot of different horses. Their experience really showed today." 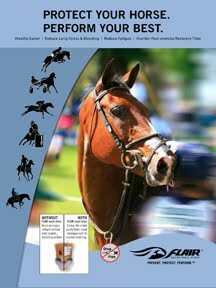 "The first and last fences are the most important fences in any class. We were looking for the first fence to be ridden according to the horse... These two riders were far above the rest, we didn't want to mix them with the others," Morris added of the decision to test the top two. Molly Braswell finished third, followed by Lucy Davis who finished fourth. Chase Boggio turned in a fifth-place finish, and Shawn Casady rounded out the top lineup in sixth. Barnhill said, "The change of horses was very nerve-wracking. I was nervous about the getting back on part. Her (Samantha's) horse is a little lazier than mine (to ride), then I kind of figured it out." Schaefer added, "When I had to do the switch, I didn't realize we'd have to get on (the other horse). It was like going from a pony to like a Clydesdale. We're used to trading, we're hunter riders." Barnhill's winning training team included David Pellegrini, Missy Clark, John Brennan, Tom Wright, and Tim and Kelly Goguen. 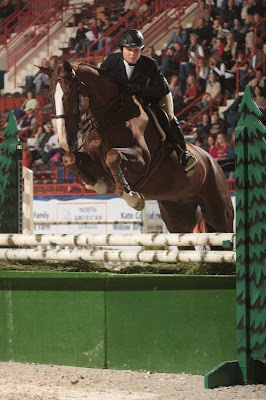 Her winning mount, Podest, was named Best Equitation Horse. The world-class equestrian competition at the Pennsylvania National Horse Show continues through Saturday, October 23 at the Pennsylvania State Farm Show Complex in Harrisburg. Tomorrow night will feature Hunt Night with terrier races, the North American Horn Blowing Championship, a parade of hounds, and competition by local Hunt teams.